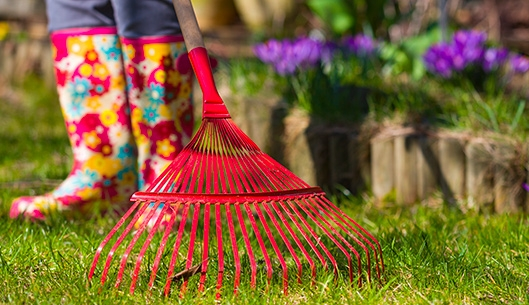 Spring Clean Your Health This Season! Winter feels like a time of accumulation and heaviness—it’s reflected in the weather, layers of clothes, food choices, and winter chores like shoveling snow and chipping ice from sidewalks. So it’s no surprise that in the spring we all feel like lightening up a bit. While some have described gardening as a “passive” activity, anyone who has spent a day dividing and transplanting perennials knows differently. But on the plus side, that extra work you do beautifying your yard is good exercise, too. Springtime naturally inclines us toward green things growing and fresh fruits and vegetables. It feels like the right time to jettison some heavier (and potentially unhealthy) choices from winter. If you have a farmer’s market in your community, you can support local growers by purchasing their salad greens, morels, early onions, and other delicious foods that literally dress up your plate with good taste. For some reason, we tend to hold off on all of our favorite reading for spring and summer. If that’s the case for you, make the best of it: investigate the mystery novel you’ve been thinking about, explore a creative non-fiction account of a famous trek (or a trek gone famously wrong), or simply brush up on your favorite flora with a field guide. Or, continue your own healthy journey by checking out books on health and wellness to help you stay in the groove. Planning your own Great American Road Trip doesn’t necessarily mean a lot of time or expense. Your schedule may require shorter weekend day trips, or a couple of extended weekends. It’s very likely some hidden destination gems are virtually within view. Consider picking up a 60 Hikes within 60 Miles guide, or something like it that helps you plan an enjoyable, low-key trek. Simply breaking free of a routine may be the best expedition you can plan with your family or friends. Screen time seems almost like a rite of winter. The comforting glow of a TV or checking the feed on a smartphone appears to keep us connected while still being cocooned. But it can become habit-forming too. Instead, as the weather warms, rediscover lingering evenings with the people you love with the night sky as a backdrop rather than an electronic screen. You’ll improve your sleep by avoiding flickering screens and build memories with the friends and family in your real-world social network. Dan is a health and medical writer who primarily focuses on botanical ingredients, whole foods, and natural medicine. He is fascinated with traditional medicine practices and has a diverse background in reporting, editing, publishing, and marketing.